Even though it warmed up later in the day, the morning was chilly and the evening is cooling down. I thought chili pie sounded good. All I needed were the right ingredients. Turns out, we had them in the cupboard and fridge. Fantastic! Chili Pie - 15 minutes to delicious. It took about seven minutes to throw the ingredients together on a plate, cover it with another plate, and microwave it on seventy-percent power for four minutes, then another four minutes on high. 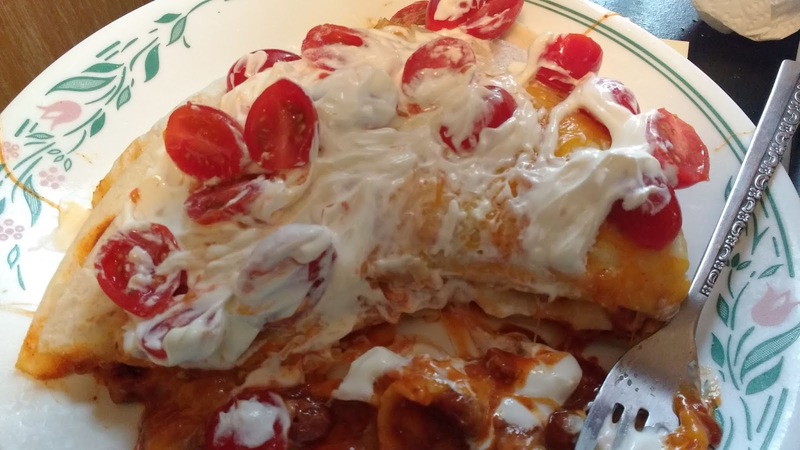 I then topped the chili pie with diced tomatoes, and some sour cream. I would like to go back for seconds, but I'm kinda stuffed. I'm glad I didn't go ahead and make that salad, too. It'll make four decent slices for a group of four to share, or two for the semi-starved to polish off, or one really big chili pie if you're not in a mind to share at all. I'll best this would taste even better after chilling in the fridge for a while.